Published on Tuesday, October 4, 2011. This is the second in a series of posts about the Getty Institute's Pacific Standard Time by Joyce Lovelace, our L.A. correspondent. Her previous post was Getty Exhibitions Open, and the Stars Come Out. 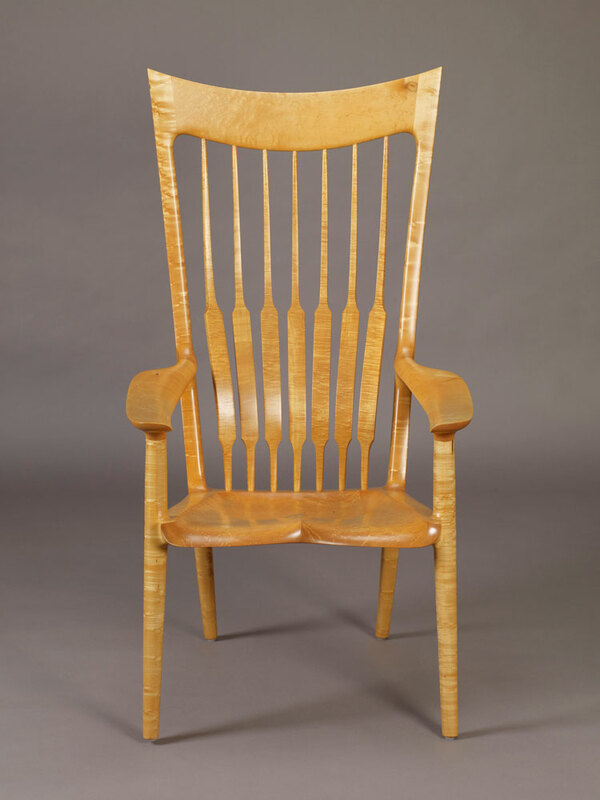 Sam Maloof was the most famous American woodworker of our time. People who know next to nothing about furniture know his name. The state of California proclaimed him a Living Treasure. Presidents Carter, Reagan, and Clinton all rocked in his chairs. Legend has it Ray Charles ran his hands over a Maloof piece and declared it had soul. 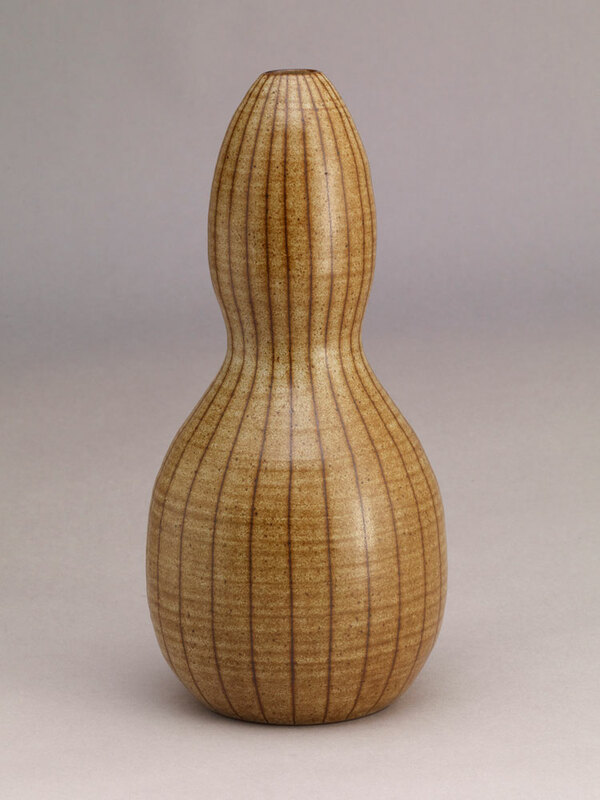 There was more to Maloof's genius, though, than his way with wood. The lyrical title of the Huntington's show has layers of meaning. In a literal sense, "the house that Sam built" was a spectacular, art-filled redwood one in Alta Loma, at the foothills of the San Gabriel Mountains 40 miles east of L.A., where he lived and worked since 1953. But it also refers to the creative community he built around himself through his extraordinary capacity for friendship. 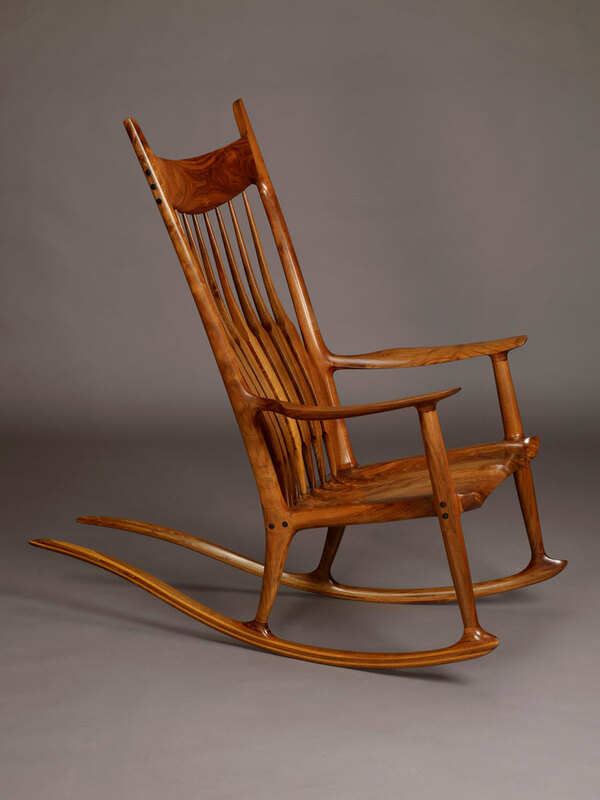 Naturally gregarious, Maloof expressed a happy humanity both in his work and in the camaraderie he enjoyed with other artists and craftspeople. 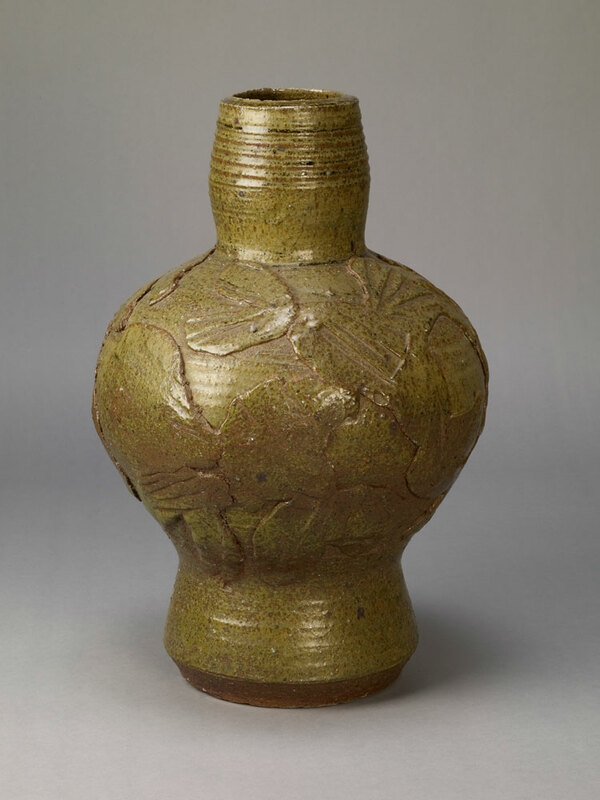 Sam's group encompassed painters and printmakers, potters and sculptors, woodturners and weavers, all of whom collected, inspired and influenced each other's work. Harold Nelson, who as curator of American decorative arts at the Huntington put together "The House that Sam Built," sees this collegial spirit as key to the Maloof story. Hal is an impeccable scholar and connoisseur whose special interest is modern and contemporary craft. His shows and catalogs are always meticulously researched and thoughtfully presented. His arrival at the Huntington a few years ago coincided with a new embrace of 20th-century American art at that august institution, best known for European Old Master paintings such as Thomas Gainsborough's The Blue Boy. 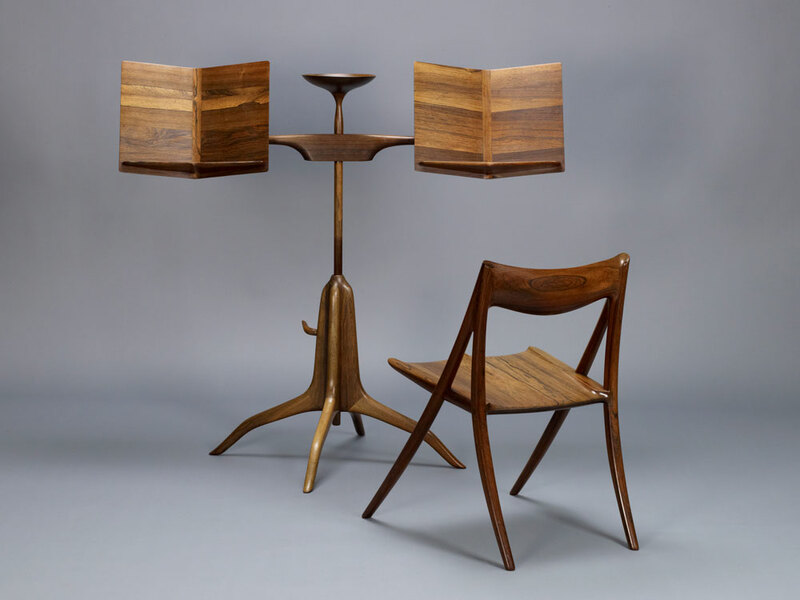 One of the first additions Hal helped bring to the Huntington collection was a splendid music stand and accompanying chair made by Maloof (in 1969 and 1972, respectively) for Jan Hlinka, principal violist with the Los Angeles Philharmonic. The set was quintessential Maloof, Hal felt, significant not only for its beauty but also for the way it embodied the close friendship that developed between the two men. In January 2009 I was invited to write an article about that acquisition for the membership magazine Huntington Frontiers. I began by interviewing Hal, who was already planning a whole show devoted to Maloof and friends. He then arranged for me to drive with him out to Alta Loma, to meet and talk with the famed woodworker, then 93 and still active in his shop. Sam Maloof had a glow. I can think of no other way to describe the warmth that emanated from this man. Hal and I ended up spending an entire morning with him, as he reminisced about the Hlinka commission and his amazing career. He made it very clear he felt blessed to have spent a lifetime doing work he loved, work that made people happy. Above all, he said several times, the most meaningful aspect for him was meeting and getting to know his clients. He then gave us a tour of that famous house he'd shared with his first wife, Alfreda, until her death in 1998. Now it was a museum, on the National Register of Historic Places. (Maloof resided in a newly built home on the property with his second wife, Beverly.) Large, meandering and homey, it was filled with charming handcrafted details, lots of Maloof furniture, and countless works by artist friends. He took great pleasure in pointing out a particular piece, recalling its maker, and sometimes telling the story behind it. Though his knee was bothering him, he was still able to jog up and down stairs as surely as if he'd crafted each step himself, which of course he had. The tour ended at his shop, where Maloof introduced us to his longtime assistants Larry White, Mike Johnson, and David Wade - "the boys," as he affectionately called them. By then it was lunchtime. Maloof invited Hal and me to join him, Mike, and David at a diner in town, where he was a regular. When we entered, it was as if the President had arrived. Every customer, it seemed, had to greet Sam and shake his hand as he made his way to our table in the back, where the wait staff made a great fuss over him. Over Mexican food, he chatted about this and that: his friend Jimmy Carter, his days as a craftsman-trustee of the American Craft Council. When the check came, he insisted on treating. I can say that Sam Maloof bought me a burrito. I can also say, with sadness and gratitude, that I was one of the last people to have the great privilege of spending time with this extraordinary craftsman, in his element. He died four months later. Having seen firsthand what a people person Maloof was, I can't help thinking how much he'd have enjoyed opening night of "The House That Sam Built." It was dark when my husband and I arrived at the Huntington, and we had to wander its extensive grounds a bit to make our way to the right building. We rounded a corner and suddenly there it was: the stately MaryLou and George Boone Gallery, all lit up, a big banner illustrated with a rocker, refreshment tables, live music, all proclaiming Major Exhibition. Amazingly, a block-long line of visitors stood three and four deep, patiently waiting to enter the gallery. I had never seen that at a museum opening. A staff member told me the Huntington had received 1,800 RSVPs, a response not equaled since its landmark Greene and Greene show a few years back. Inside, the atmosphere was joyful. Maloof's spirit resonated throughout the gallery, where his furniture was lovingly juxtaposed with wood vessels by Bob Stocksdale, a woven hanging by Kay Sekimachi, paintings by Karl Benjamin and Millard Sheets, ceramics by Betty Davenport Ford, and on and on - a gathering of gifted personalities who understood and harmonized with each other. Viewers seemed truly engaged with the work. This was most apparent in a room devoted entirely to Sam and his shop, where another line had formed, this time to try out a Maloof chair set up for that purpose. I watched as, over and over, a person would carefully ease into the chair and then instantly relax, with an expression of pure comfort and joy. 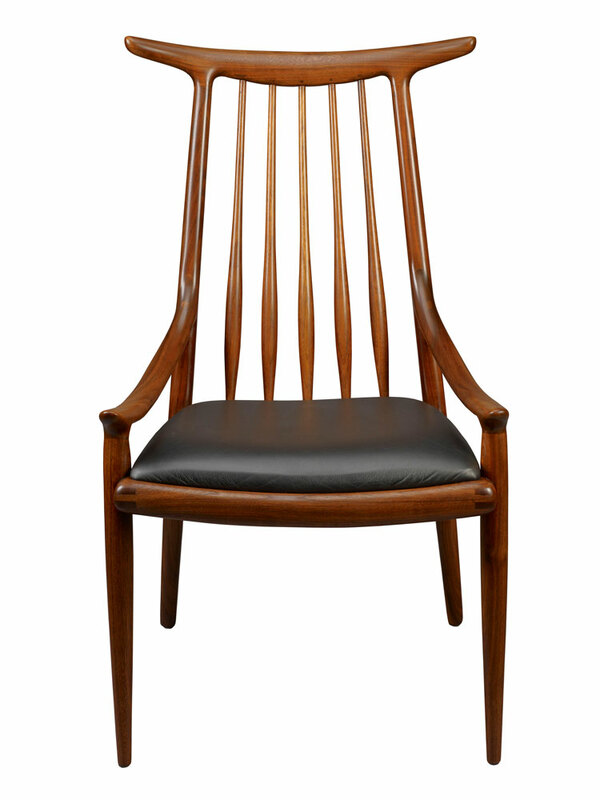 When you sit in a Maloof chair, you find it hard to tell where it begins and you end. "You would never think a wooden chair could be so comfortable," said one woman. "It's got all the right curves," remarked her husband. Then their son, about 14, sat down. It took about a half-second for the smile to spread across his face: "Whoa." Back home, my husband, who had gone in knowing little about Maloof and come out a big fan, made an observation as astute as any I could imagine. "He understood the body, and he understood wood. And he made furniture for people." 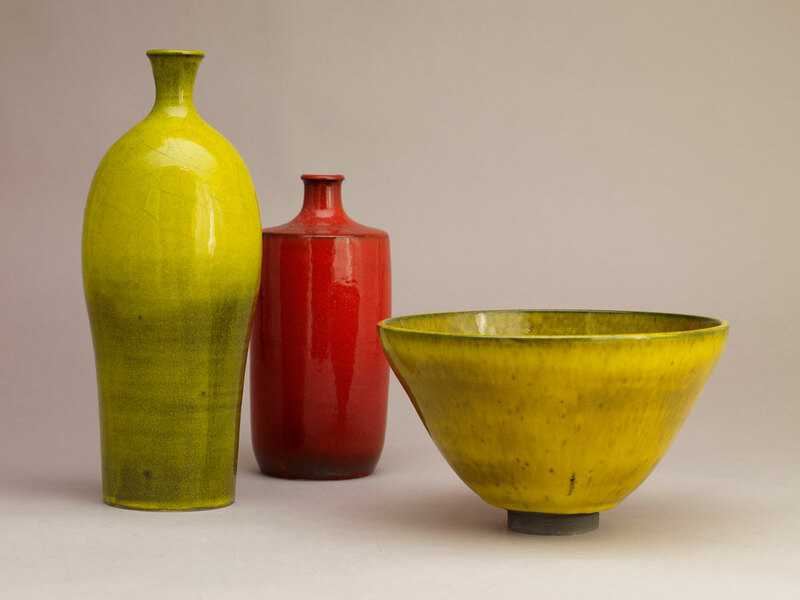 Tomorrow: "The Golden State of Craft" and June Schwarcz at the Craft and Folk Art Museum. Joyce Lovelace is American Craft's contributing editor.